Between work, jumping through hoops for a broken-leg kid and delightfully spending hours in clinic waiting rooms again I finally found a little time to write the next of 55 days of BtVS. Took me long enough. Spike. Always was, always will be. My whole life I’ve been a sucker for bad boys with a soft side, and Spike fits this description perfectly from his first moments on the show. But it’s so much more than that. delightfully evil first, soft and tender immediately after. 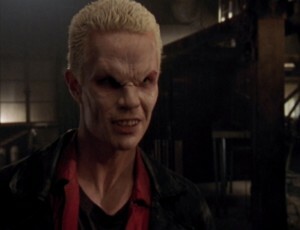 It takes all of two scenes on screen for him to show that he’s not the stereotype vampire we knew until then, but a wonderfully layered character and a captivating new Big Bad at that. But it doesn’t stop there. His character, already so much more interesting from the get go than most of the others, experiences the most changes and growth that I have seen in any show to date. It’s not only marked by a beautiful and impressing redemption arc, but it turns out that this is only the last part of his many transformations. As we see in Fool for Love, after 3 years of knowing him, he started out completely different than we always thought - as a shy and bullied-by-his-peers Victorian gentleman who cares deeply for his mother. only to fall victim to the one trait neither turning nor self-modeling could take away – his ability to love. It’s what makes his redemption arc so special and the most beautiful I know of on screen – he again changes fundamentally, and this time knowingly, willingly, for love. It’s not the chip setting him on this path (though it certainly helps with the awareness); with the chip he’s still absolutely enjoying his work of destroying the bond of friendship surrounding the Slayer, and his evilness altogether. It’s the moment when realization hits him that he has fallen in love with her that changes everything. The moment he wakes up and knows it, he’s shocked to the core, because he knows instantly he will act on it, which means life as he knew it for the last century is over. 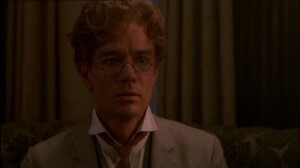 Watching him trying his hardest, making himself vulnerable, letting him being tortured rather than betraying his love’s sister, becoming a trusted ally, breaking down at Buffy’s death, then trying and failing to help her, and ultimately failing her and himself – that’s just incredibly heartbreaking or heartwarming and always utterly fascinating. Seeing him doing the unthinkable as the immediate consequence, getting his soul back and thus going the final, the crowning step of his redemption all by himself and as willingly as all the other steps is indescribable satisfying to me. And he’s still not finished. He suffers from his past deeds, but instead of sinking into depression changes himself again, this time to the useful fighter he needs to be to support his love, finally finding a healthy balance in the end. Well, before he dies, sacrificing his life for the world and thus fully redeeming himself. I love that he not simply reverts to his old Victorian self with the soul, this guy that the vampire always hated and wanted to get rid of, but picks the best of each persona he ever presented. Soulful Spike could’ve turned out as lame as Joan predicts, but he’s still so interesting. 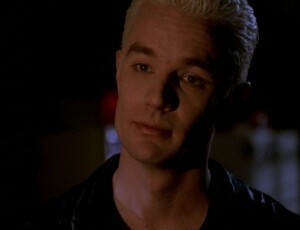 James Marsters has a huge part in the fascination that is Spike. Without his incredible ability to act the hell out of his character from the start, I doubt he would have become a regular. He brings out each of the layers within with just a look, a tilt of his head, a smile so small that it can almost not be seen. But it’s not only his good looks or even the acting; it’s the perfect symbiosis – I don’t even find JM that attractive, except when he plays Spike. Then he’s gorgeous. It’s both – the character and the one who brings him to life. BtVS is a fantastic show with many fantastic characters played by brilliant actors, but apart from the core four, most of them are replaceable, more or less, without losing much. 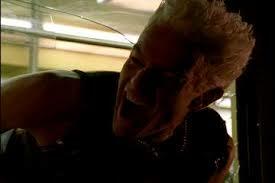 But there’s no doubt for me: Without James Marsters’ Spike, Buffy wouldn’t be the same.